The town of Sfax is approximately 270 kilometres south of Tunis and can now be reached by autoroute from Tunis. 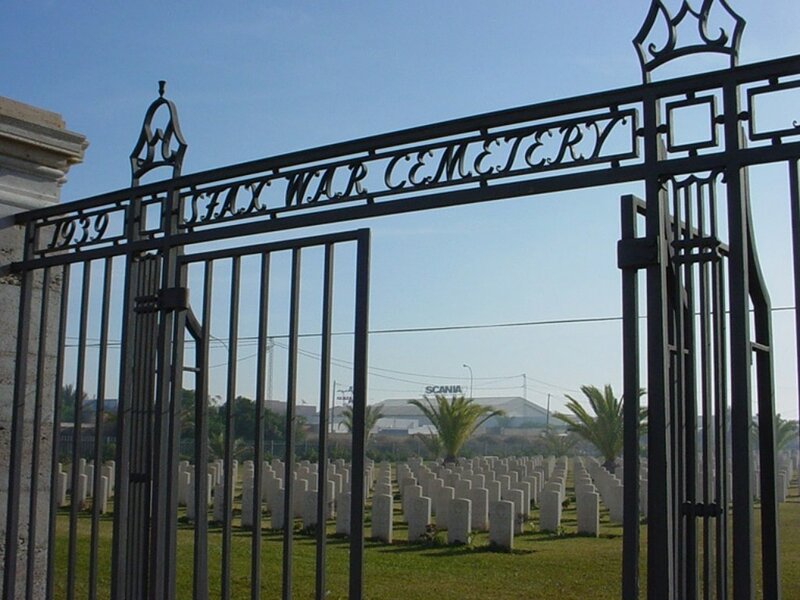 The War Cemetery is located approximately 2 kilometres south of the town centre on the road to Gabes. In the south, the Axis forces defeated in Egypt at El Alamein withdrew into Tunisia along the coast through Libya, pursued by the Allied Eighth Army. 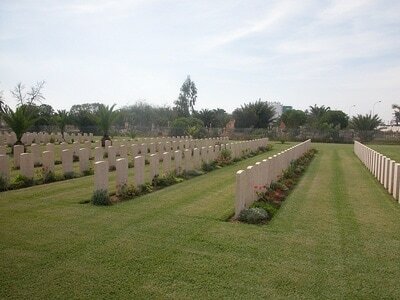 Most of those buried in Sfax War Cemetery died in attacks on successive Axis positions at Medenine, the Marith Line and Wadi Akarit, in March and April 1943. 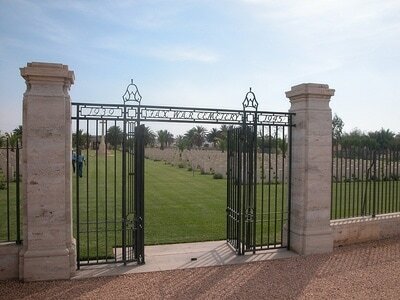 The cemetery contains 1,253 Commonwealth burials of the Second World War, 52 of them unidentified. 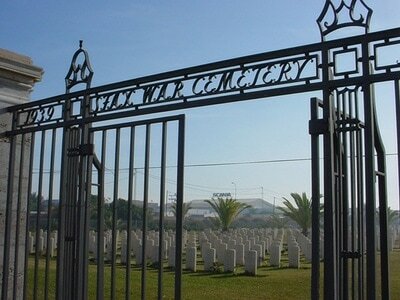 The single First World War grave in Sfax War Cemetery was brought in from Bizerta Sidi Saleru Moslem Cemetery in March 1983. There is also 1 Greek soldier of the 1939-45 war buried here. 4347754 Private Eric Anderson, V. C.
5th Bn. East Yorkshire Regiment, died 6th April 1943, aged 27. Plot II. C. 14. Son of George and Mary Ann Anderson, of Fagley, Yorkshire; husband of Irene Anderson, of Fagley. 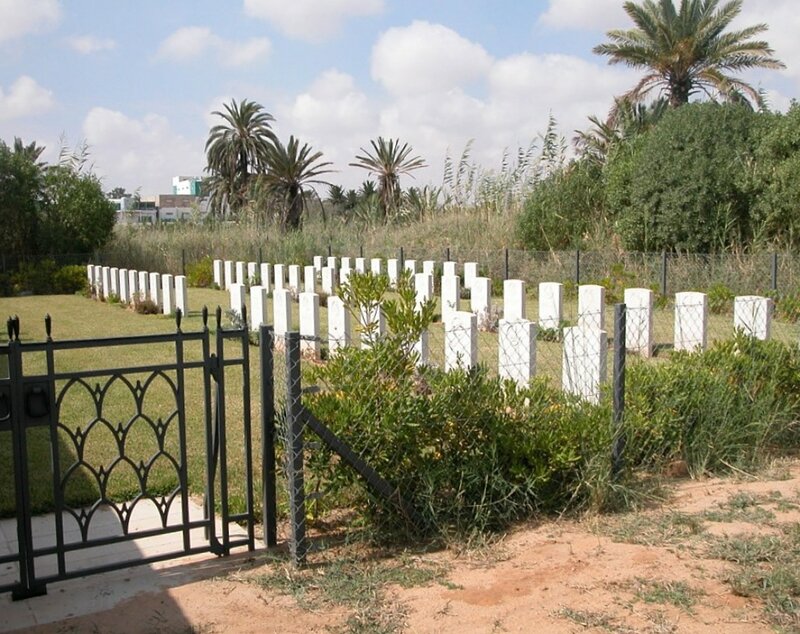 Citation: The citation in the London Gazette of 29th July, 1943, gives the following details: On 6th April, 1943, a battalion of the East Yorkshire Regiment was attacking a strongly held enemy locality on the Wadi Akarit in Tunisia. One company of the battalion was forced to withdraw in the face of intense and accurate machine-gun and mortar fire, leaving a few wounded in the open. Private Anderson, a stretcher-bearer, carried three wounded men from the bullet-swept slope, and while administering first aid to the fourth man was hit and mortally wounded. 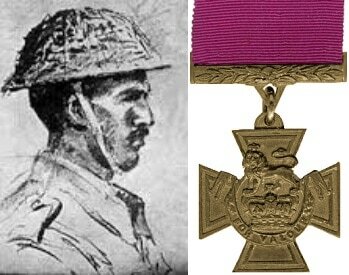 By this valour, complete disregard for personal safety and courage under fire, Private Anderson probably saved the lives of three of his comrades. 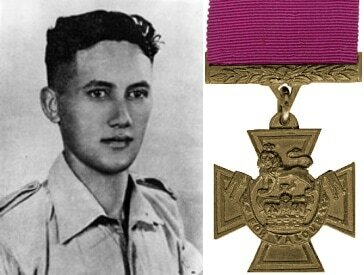 His gallantry was an inspiration to all who witnessed it. 8638 Company Havildar Major Chhelu Ram, V. C.
4th Bn. 6th Rajputana Rifles, died 20th April 1943, aged 38. 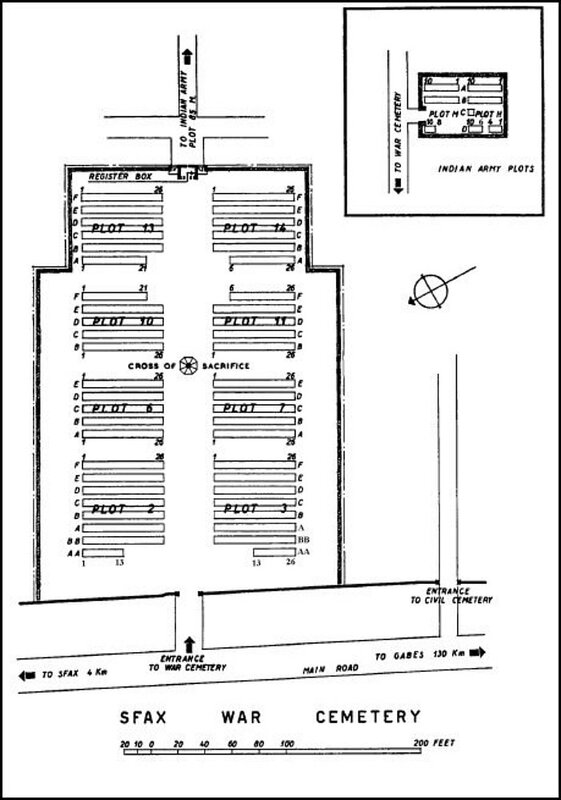 Plot H. C. 5. Son of Ji Ram and Kesar, of Dhenod, Bhiwani, Hissar, India; husband of Shrimati Maha Dei, of Dhenod. Citation: The citation in the London Gazette of 27th July, 1943, gives the following details: During the attack by the 5th Indian Infantry Brigade on the Djebel Garci in Tunisia, on the night of 19th/20th April, 1943, Company Havildar Major Chhelu Ram was with one of the two leading companies, which while approaching the battalion's second objective were held up by a machine-gun post situated on high ground. C.H.M. Chhelu Ram dashed forward with a tommy-gun through heavy fire and single-handed silenced the post, thus enabling the advance to continue. As the leading companies were approaching their third objective the company commander was mortally wounded. C.H.M. Chhelu Ram went to his assistance in a completely exposed position, and was himself seriously wounded. Nevertheless, taking command of his own company and elements of the other, he quickly reorganised them, and so inspired them with his fine example that they successfully repelled a counter-attack. During the fighting he was again wounded, but refused to be carried back, and continued to command his men until he lost consciousness; he died a few minutes later. His magnificent action, leadership and utter contempt for danger were an inspiration to his men and were the chief contribution to the holding of vital ground. 39784 Second Lieutenant Moana-Nui-A-Kiwa Ngarimu, V. C.
28th (Maori) Bn. New Zealand Infantry, died 27th March 1943, aged 24. 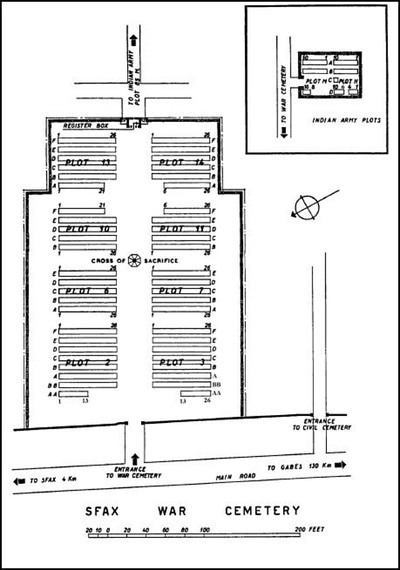 Plot X. E. 14. Son of Hamuera Ngarimu and Marea Ngarimu, of Ruatoria, Gisborne, New Zealand. 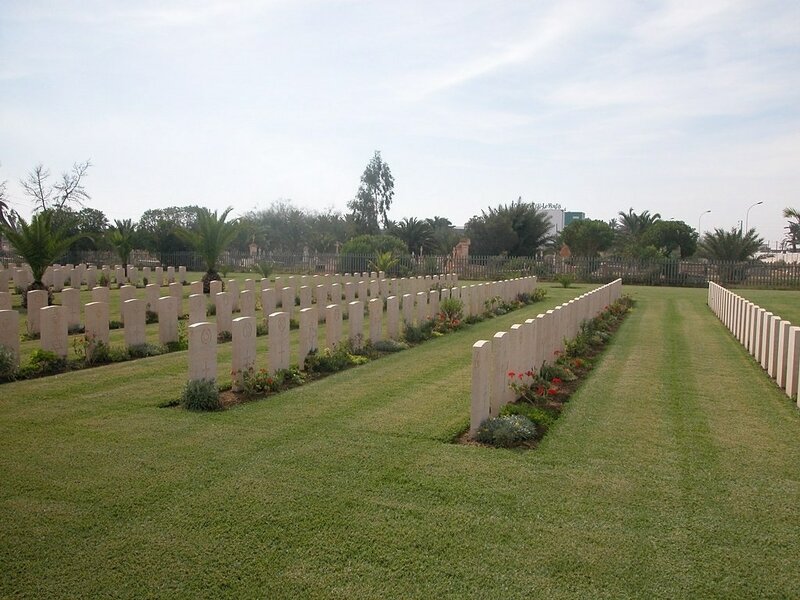 Citation: The citation in the London Gazette of 1st June, 1943, gives the following details: During the attack at Tebaga Gap on 26th March 1943, Second Lieutenant Ngarimu commanded a platoon. He was first to reach the crest of the hill and himself destroyed two enemy machine-gun posts. The enemy counter-attacked, and in the course of hand-to-hand fighting, Lieutenant Ngarimu was twice wounded, but refused to leave his post. During the night the enemy succeeded in piercing the line; Lieutenant Ngarimu ran to the spot, killed some and drove back the rest with his tommy-gun and with stones, and led his men back to their old position. In the morning, he was killed while defying a further counter-attack. 26914 Lieutenant Colonel Anthony Derek Seagrim, V. C.
Commanding 7th Bn. 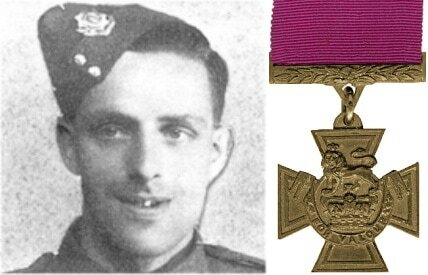 Green Howards (Yorkshire Regiment), died 6th April 1943, aged 39. Plot XIV. C. 21. Son of the Reverend Charles Paulet Cunningham Seagrim and Amabel Emma Halsted Seagrim, of East Dean, Sussex. 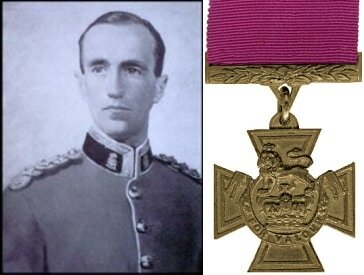 His brother, Hugh Paul, also fell and was awarded the George Cross. Citation: The citation in the London Gazette of 11th May, 1943, gives the following details On the night of 20th/21st March, 1943, a battalion of the Green Howards was ordered to attack and capture an important and strongly defended feature on the Mareth Line. The battalion was subjected to intense fire; it appeared more than probable that it would be held up and that the main attack would fail. Lieutenant-Colonel Seagrim realized the seriousness of the situation and at the head of his battalion led it through a hail of fire to the assault, personally attacking two machine-gun posts; it is estimated that in this phase he killed, or captured, twenty Germans. By his personal courage, disregard for his own safety, and outstanding leadership he so inspired his men that the battalion successfully took and held its objective, thereby enabling the attack to proceed. Lieutenant-Colonel Seagrim subsequently died of wounds received in action.